Abel Makkonen Tesfaye (Ge'ez: አቤል ተስፋዬ, ʾÄbel Täsfaye, born 16 February 1990), known professionally as The Weeknd (pronounced the weekend), is a Canadian singer, songwriter, and record producer. The Weeknd is the alias of alternative R&B enigma-turned-pop star, whose aching accounts of emotionally and physically toxic indulgences have translated to multi-platinum sales and Grammy recognition. The singer and songwriter made his early-2010s breakthrough with morose ballads that seemed to have no designs on mainstream appeal. Within a few years, however, Tesfaye had scored Top Ten hits with an Ariana Grande duet ("Love Me Harder"), the lead single from a major motion picture ("Earned It"), and a retro-contemporary disco-funk single ("I Can't Feel My Face"), the last of which was nominated for a Nickelodeon Kids' Choice Award despite its subject (cocaine). Tesfaye received early support from Drake and scored his first Top Ten R&B/hip-hop placement as the featured artist on the fellow Torontonian's "Crew Love," but he swiftly outgrew his status as a Drake affiliate with his own hits and a streak of appearances on high-profile tracks by Wiz Khalifa, Future, Beyoncé, and Lana Del Rey. Tesfaye debuted the Weeknd in late 2010 with three songs uploaded to YouTube. Made with producer Jeremy Rose, they served as a low-key prelude to three mixtapes self-released as free digital downloads the following year. First was with House of Balloons (March), where clear traces of radio-friendly contemporary R&B à la Trey Songz, Jeremih, the-Dream, and Drake were synthesized with the progressive left-of-center likes of Spacek and Sa-Ra. Recorded in collaboration with producers Doc McKinney and Illangelo, among others, the set garnered widespread coverage within days of its release. A similar second mixtape, Thursday (August), preceded several appearances on Drake's album Take Care. Featuring a cover of Michael Jackson's "Dirty Diana," Echoes of Silence (December) completed the trilogy just before the end of the year. The following June, "Crew Love," off Take Care, reached the Top Ten of Billboard's Hot R&B/Hip-Hop chart. A few months later, Tesfaye was featured on another charting single, Wiz Khalifa's "Remember You." After Tesfaye signed with Universal Republic, the three Weeknd mixtapes were remastered and bundled with three new songs for Trilogy, issued in November 2012. Despite consisting of material previously available for free, the set debuted at number four on the Billboard 200 chart. The following April, Tesfaye won Juno Awards in the categories of Breakthrough Artist of the Year and R&B/Soul Recording of the Year. Trilogy was certified platinum by the RIAA the next month. Kiss Land, much darker in tone than its title implied, followed in September 2013 and debuted at number two. Out of its several singles, only "Live For," featuring Drake, touched the Hot R&B/Hip-Hop chart. Tesfaye had much more success with a series of non-album singles that followed. "Often," released in 2014, was a Top Ten R&B/Hip-Hop hit. He was featured on Ariana Grande's "Love Me Harder," which reached the Top Ten of the Hot 100 and went platinum in the U.S. "Earned It," featured in Fifty Shades of Grey, repeated the same feats. 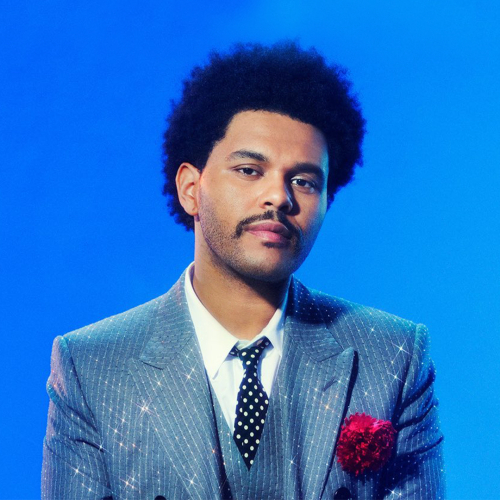 In 2015, Tesfaye issued "The Hills," a booming, nightmarish ballad co-produced by Illangelo, and "Can't Feel My Face," an upbeat Max Martin collaboration, as the first two singles from Beauty Behind the Madness. Both songs topped the Hot 100. The album was issued that August and debuted at the same position. At the 58th Annual Grammy Awards, it won in the category of Best Urban Contemporary Album, while "Earned It" received the nod for Best R&B Performance. Through the end of 2015 and into 2016, Tesfaye was featured on Disclosure's "In the Night," Kanye West's "FML," Future's "Low Life," and Beyoncé's "6 Inch." "Starboy," produced by Daft Punk, was released in September 2016 as the lead single from Tesfaye's album of the same title. It became the singer's fifth Top Ten pop single prior to the November arrival of Starboy, which landed on top of the Billboard 200. The album's success was sustained with the second single, its other Daft Punk production, "I Feel It Coming." Appearances on singles by Nav, Lana Del Rey, and French Montana were scattered through 2017. The following year saw the Weeknd appear on the track "Pray for Me," with Kendrick Lamar -- one of the lead singles from the official soundtrack for Marvel's Black Panther movie. In March of 2018 he dropped a surprise EP titled My Dear Melancholy,. The release marked a return to the darker sound and aesthetic of Trilogy and featured contributions from Gesaffelstein, Skrillex, and Mike WiLL Made-It.